Nessy, an adult female olive ridley, was found was found entangled in a ghost net by our neighbour resort Finolhu in Baa Atoll. 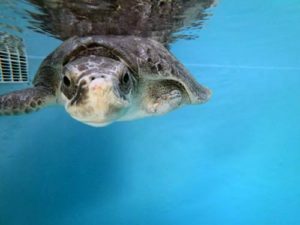 She arrived with deep wound around her neck from the ghost net, but she has all her four flippers intact. 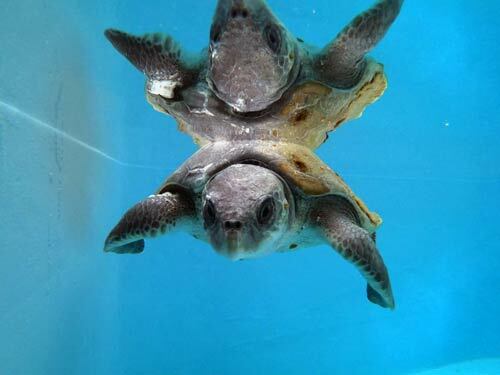 Nessy is a very strong and feisty turtle. We confirmed through x-ray and ultrasound exams that she has no major internal injuries from being entangled, however she is suffering from pneumonia and fluid in her lungs and we are treating her neck wound. She is also buoyant, but we hope we will have her back in the big blue very soon. Rudolph, a juvenile olive ridley, was sent to us from the care of Atoll Marine Centre. She had been sick for a month and was steadily getting worse. After excreting plastic she was taken for an X-ray. 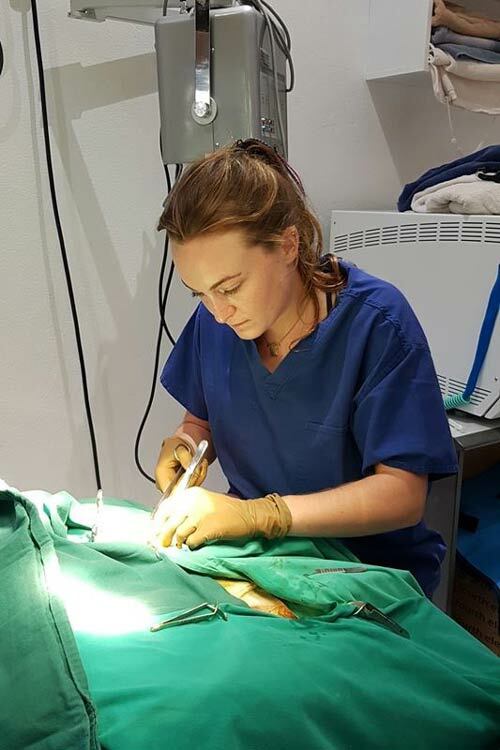 Our vet reviewed the X-rays and recommended that she was sent to the Rescue Centre for surgery: she had distended guts and a large area of trapped gas inside that took up much of her internal space. We performed surgery the day she arrived. She had severe pneumonia and chronic lung changes in her right lung. We also discovered a severely diseased and hardened bladder that no longer functioned. In addition, she had a large balloon of gas connected to her lung and guts as we saw on the X-ray. Initially we thought this was caused by a blockage, however this was not the case. We checked her guts to ensure there was no further plastic inside and drained the area of gas build up. We are unsure of the cause of this – it possibly arose from a lung tear or from damaged guts. Due to her severity of her condition, Rudolph’s body struggled with the anaesthetic. We gave her a light and short-acting sedation dose that should wear off after 30-60 minutes, however, she was still unconscious and not responding hours after surgery. We stayed with her well into the night, breathing for her using a bag, administering adrenaline to keep her heart strong and giving her warm showers to keep her body temperature up and her skin damp. After 15 hours of this, at 2am, her heart finally stopped and she passed away. At postmortem we discovered damage and infection to her gut, potentially caused by ingestion of plastic. 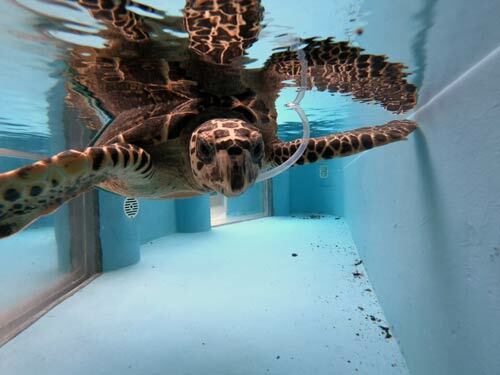 We have said goodbye to Isla who has gone to live at the Atoll Marine Centre for her continued rehabilitation. 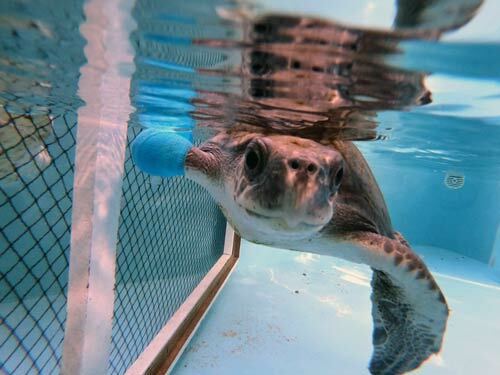 Isla had been at the Rescue Centre since June last year after losing two flippers from being entangled in a ghost net. She had also been hit by a boat and suffered shell damage. 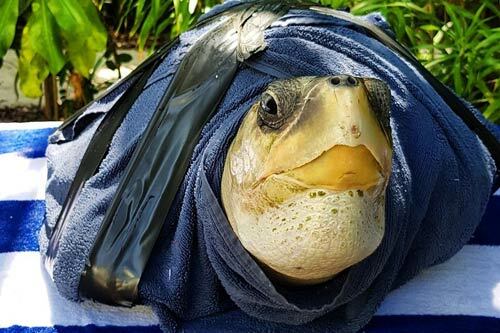 Isla healed fully from her injuries, however she continues to suffer from buoyancy syndrome and struggles to swim with just two flippers on the same side. Isla wrapped up and ready for her sea plane trip. Due to her disabilities there is little hope that Isla will survive in the wild. 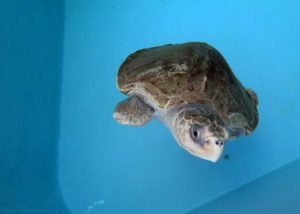 For now she is being taken care of by Atoll Marine Centre as we needed tank space for turtle patients requiring surgery. We miss her dearly! 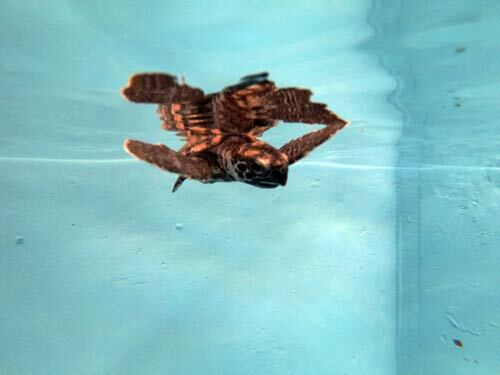 Lisle, our baby hawksbill, started diving for the first time a couple of weeks ago. 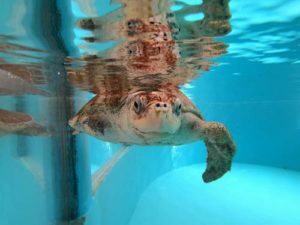 After arriving to us buoyant and not eating due to pneumonia, it is fantastic to see her respond to treatment. She has now finished her medication for pneumonia. She is eating, active and diving. She has also put on 20g since coming to us! We are very pleased and will plan her release in a few weeks, as long as she stays healthy off antibiotics. 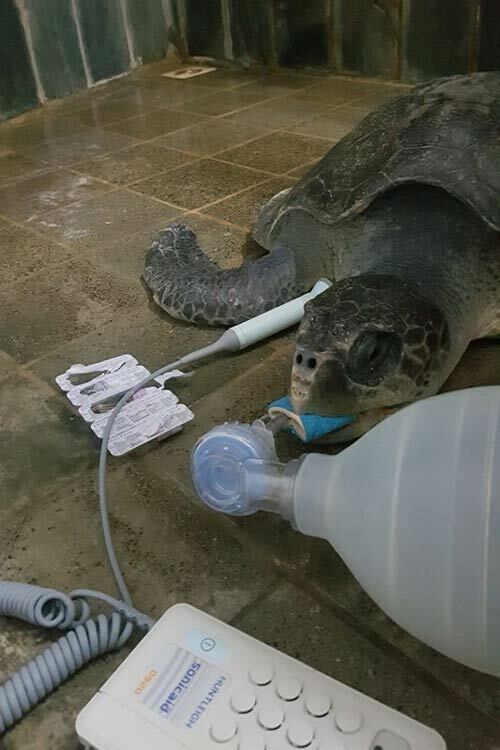 Cocoa, our sick hawksbill, was not eating so we surgically placed a feeding tube into her stomach. She is getting tube fed 4 times a day, using blended fish with added prebiotics, vitamins and minerals. We are still offering her food to eat at meal times as she can still eat with the tube if she wants to. She is now much stronger and active, and is swimming in her tank. So much so that she managed to pull her stomach tube out! We had to perform a second surgery a to place a new tube into her stomach. She has starting biting at food but is still not eating, so we continue to give her liquid food through her tube. We performed a barium study this week whereby we administered a liquid that shows up white on X-ray. We have been X-raying her daily to watch the barium move through her guts to check for blockages and motility. She excreted the last of the barium 107 hours after we gave it, so food is taking 4.5 days to move through her guts. This is good and there are no signs of any blockage on the X-rays. This means we don’t need to do internal surgery and can treat her gut problem medically. Eve has had her bandage off and a repeat X-ray to check on her broken flipper. 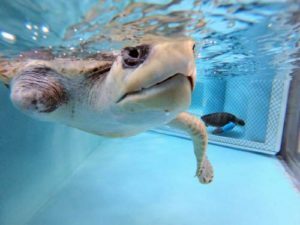 She has formed scar tissue around her previously exposed bones and the flipper looks healed. 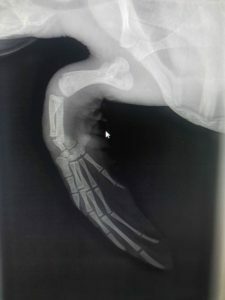 However the scar tissue has pushed apart her radius bone fragments, meaning the space is now too big for that bone to heal. She is not using that flipper very well and can’t move it properly due to the injury. We will either give her more time for that area to strengthen or she may have a second surgery to try and re-attach some of the muscles that were cut by the net to try and improve function. Daniella had surgery to remove the stump left by the ghost net. The surgery went very well and she woke up nicely from the anaesthetic. The next day she seemed so much happier. She is swimming better, is more agile and even lower in the water and less buoyant! The exposed bone must have been uncomfortable for her and it’s nice to see her doing so well after the surgery. We also X-rayed her whilst she was asleep and she is still showing signs of pneumonia, which is why she is still buoyant. Daniella did dive for the first time during an ocean swim last week. The next day she managed to dive a little in the tank after food. Her wound is healing nicely and she will have stitches out in another week or two. She remains on antibiotics for pneumonia. Heidi remains settled and eating well, however is showing no improvements in her front flipper. We are considering attempting a surgery to try and help her start using it again, although it is a long shot. She has now been with us 9 months and shown no improvement in that flipper after it was badly damaged by the ghost net. This would be her last chance to help her regain use of it otherwise she will have to be re-homed to an aquarium. Juanita is much the same and enjoys her meal times. She has had no change in her buoyancy but continues to be a little character. 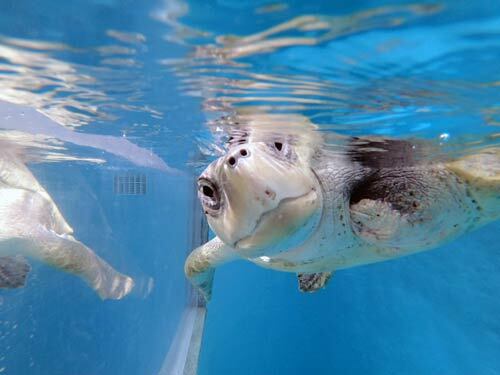 Penny continues to have swimming lessons in the ocean, and last week she did very well. She is still struggling to dive, however, as we got close to the reef drop off, she seemed to settle and control her buoyancy, which was fantastic! Unfortunately, we had a long swim to take her back but it was nice to see her make improvements during the swimming session. She even had her own personal photographer as a lady from a UK newspaper was there to capture her best side!